Take Interstate 70 west to exit 54 (State Route 72). Turn right at the exit ramp.. Stay on State Route 72 (South Limestone Street in town) to Selma Road (6th light). Turn left at the Selma Road intersection. Selma Road will fork left and right. Turn right. This will bring you back to South Limestone Street. The Performing Arts Center is located at 300 South Fountain Avenue, about two (2) blocks north on the left. We are located laparkan.com/buy-sildenafil/ directly across from the Springfield YMCA and the Clark County Public Library. Take Interstate 70 east to exit 54 (State Route 72). Turn right at the exit ramp. Stay on State Route 72 (South Limestone Street in town) to Selma Road (6th light). Turn left at the Sema Road intersection. Selma Road will fork left and right. Turn right. This will bring you back to South Limestone Street. The Performing Arts Center is located at 300 South Fountain Avenue, about two (2) blocks north on the left. We are located directly across from the Springfield YMCA and the Clark County Public Library. Take Interstate 75 north to Dayton. Take Interstate 675 north toward Columbus (30+ minute travel time).Take Interstate 70 east to exit 54 (State Route 72). Turn right at the exit ramp. Stay on State Route 72 (South Limestone Street in town) to Selma Road (6th light). Turn left at the Sema Road intersection. Selma Road will fork left and right. Turn right. This will bring you back to South Limestone Street. The Performing Arts Center is located at 300 South Fountain Avenue, about two (2) blocks north on the left. We are located directly across from the Springfield YMCA and the Clark County Public Library. Parking is available in the lot north of the Performing Arts Center, the eastern Clark State lot on Limestone Street and the northeastern Clark State lot on Limestone Street at the Brinkman Educational Center. There is also a lot south of the Clark County Public Library on Fountain Avenue. Parking is free. 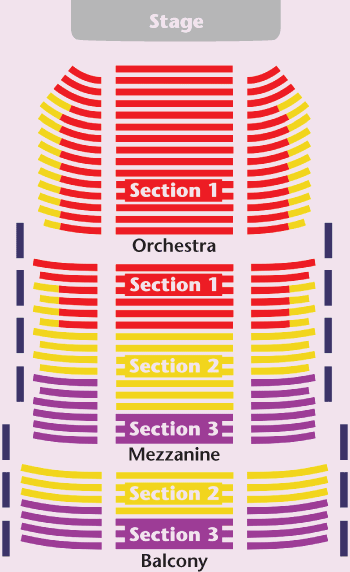 Click the image above for a large Kuss Auditorium seating chart.